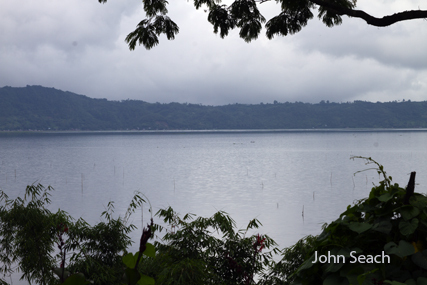 Tondano volcano is located on the western shore of Lake Tondano. Thermal acticity occurs at Batu Kolok and Sarangson, and at the Tampusu cinder cone and Lahendong maar. Tondano is one of the largest quaternary calderas in the world. The caldera is 20 x 10 km in diameter, and is open towards the west. 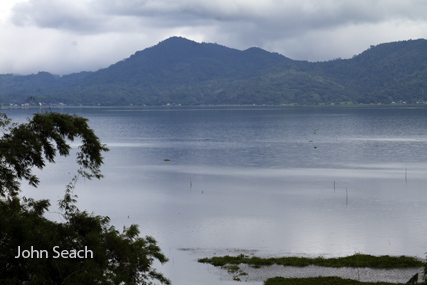 Lake Tondano occupies the caldera depression. Two major eruptive episodes formed the caldera. The first eruptions formed the Domato Tuffs. They were ejected beyond the caldera, up to 45 km north. The local thickness of the deposits are up to 30m. The Second eruptive episode at the caldera formed the Teras Tuffs. These eruptions were smaller and produced deposits towards the north and west. The most recent eruptions at the volcano produced explosive vents, obsidian, and domes. 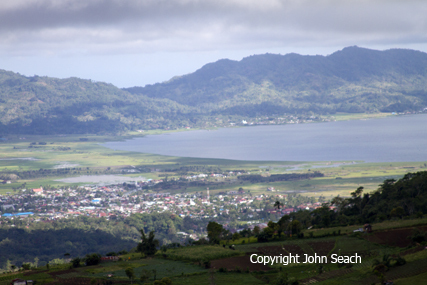 Tondano is similar to Toba and Ranau in Sumatra, and are pull-apart basins.